BitLife – Life Simulator Law School – How To Become Lawyer and Judge? If you follow this walkthrough, you will be able to join the Law School in BitLife – Life Simulator. Getting a law degree from Law School helps you in becoming Lawyer and Judge in future progress. And, that’s quite easy. But there are some things you need to take care of to get into the Law School. Sometimes, because of a single loophole, they might reject your application for Law School. 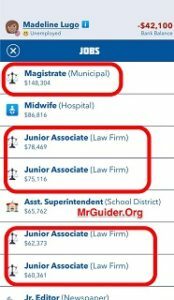 (TL;dr Walkthrough – If you want to become lawyer and Judge in BitLife, you will have to choose the right education career after graduating from high school. That is English or Political Science. After that, if everything is OK, you will get approved for the law school. Then you will look for the job in Law firm sector and earn Experience to reach the Judge level position. You can further work hard to get promoted to upper-level posts; court judge, district court judge). So that’s the short walkthrough. 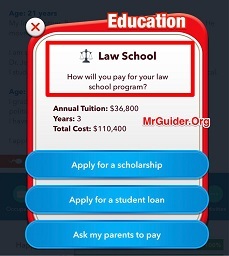 Let’s have a look at our BitLife – Life Simulator Law School Walkthrough guide – Become Lawyer and Judge! These are two achievements. If you are on Android, achievement feature is not available yet(at the time of writing this post). ⇒Before you progress further with the virtual character, pay attention to the smart stats. If the virtual character is not smart, you might get rejected for the law school. We would recommend you to start with a virtual character with more than 80% smart stats. ⇒While studying in the primary school and secondary school, visit the library every year. Additionally, tap the school button and study hard every turn. ⇒Once you are graduated from high school, the game will prompt you to choose a career option. In BitLife – Life Simulator game, to get into the Law School, you should choose English or Political Science. If you don’t find any of these options, start over. Bonus Tip – When you start life, In the timeline section, it shows you the parents information; if their job is related to Political Science or English subject, continue with that profile. For example; School, Casual Jobs. ⇒After choosing an education career in English or Political Science, you will have to work hard every year. If you are on iOS, tap the job button -> work hard. And, don’t forget to visit the library every year to maintain the smart stats. ⇒After graduating from the university with a Political Science degree or Undergraduate degree in English, the game will advise you to look for a job or seek higher education. Choose to seek higher education. 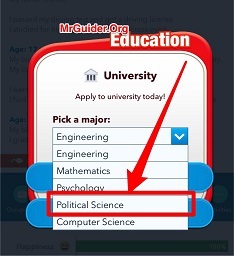 Or tap the occupation button -> Education -> Law School. Apply for the Law School. If your smart stats are good and you have worked hard in primary school, secondary school, university, your application will be approved. So that’s the complete BitLife – Life Simulator Walkthrough to get into the law school. Now, let’s learn how to become a lawyer and Judge in BitLife game. 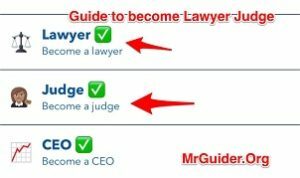 BitLife – How To BECOME Lawyer and Judge? After getting the Law degree from Law School, you will have to apply for the job in Law firm. For example; Law Clerk, Junior Associate, Junio Partner, Associate, and more. Apply for a job and work hard every year. You will become a lawyer as soon as you apply for a law firm job. Tap the menu button at the top-left corner of the screen -> achievements -> there you can see the proof! To get into the Judge career or become Judge, you need to apply for Magistrate post. To get approved, the virtual character must have 30 years experience in a law firm. So work hard for 30 years and continue with the same law firm post. It would be better to visit the library every year. Once you have 30 years Experience in Law Firm, tap the job button -> browse other job listings and apply for Magistrate(Municipal) position. If you have worked hard every year in a law firm or have enough smart stats(over 85), your application for Magistrate position will get approved. And, as soon as you get that position, you will become a Judge. 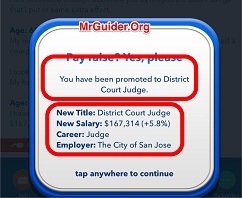 You can progress further and get court judge positions. Make sure to attend team meetings, tour while working in a law firm, Magistrate position to progress fast. So this is a complete BitLife walkthrough to become a Lawyer or Judge. If you know any other way to become Judge or Lawyer, share your walkthrough in the comment section below. Next Post:BitLife – Life Simulator Medical School – How To Become Doctor? Whatever I do, I cannot get accepted into law school. @Moto Moto If you are not getting approval for law school, it means your smart stats are quite low or you have chosen wrong education career. What I suggest is to work hard every year(all the stats over 90) and then try after you graduate from high school. It works for me. Can you specify the stats? Im able to get to magistrate level, but i only get salary increase instead promotion, ever since i accepted as magistrate i ask for promotion or apply as district court judge but got reject. . .